กล้องดูดาว กล้องโทรทรรศน์ กล้องจุลทรรศน์ กล้องดูนก กล้องส่องทางไกล Telescope Spotting Scope Binocular Magnifiers | TMK Trading Co.,Ltd. THE SMARTEST TELESCOPE IN THE UNIVERSE! A truly revolutionary product with ground breaking technology, SkyProdigy? is the product of a culmination of decades of telescope advancements. It combines electronic motors, an intelligent on-board computer, a digital camera and StarSense? technology to create an automatic, instant alignment telescope that requires no input from the user. Simply turn it on, push a button and enjoy the view! Its that easy. The SkyProdigys automatic alignment process takes only a few minutes, then you will be ready to select from thousands of objects to view. Not sure what to look at? Select the Sky Tour option; this feature offers a customized list of the best objects in the sky to view for your exact time and location anywhere in the world!No knowledge of the night sky is required. One touch innovation turns anyone into an instant astronomer! 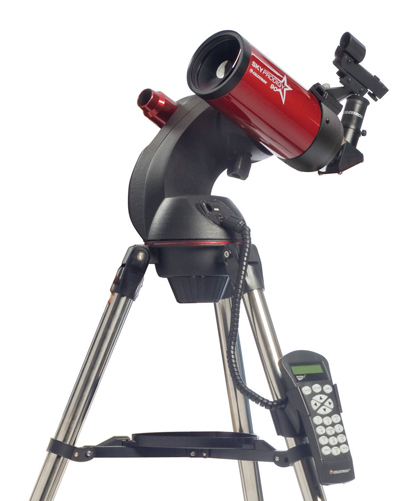 Celestrons SkyProdigy telescopes use an integrated imaging camera and patented StarSense Technology to automatically align with the night sky and determine where the telescope is currently pointing. The camera automatically captures an image of the sky, which is processed internally to positively identify the stars in the image. Once a positive match is found, SkyProdigy determines the coordinates of the center of the captured image. The process is automatically repeated two more times so that the system has three known alignment points that can be used to make an accurate model of the night sky. From this information the user can select any celestial object in the hand controllers database, and SkyProdigy will automatically move itself to the correct position. *The SkyProdigys internal camera does not have an external output allowing users to view or save the captured images. The captured images are used internally solely for the purpose of self-aligning the SkyProdigy telescope. Angular Field of View :1.7 ?